Andrea J. Loney discusses picture book biographies on Day 10 of Reading For Research Month. She says that a great biography doesn't just tell a great story, it creates an immersive experience for readers. She asks participants to look for "poetry, visual metaphors, and dramatic tension." Once again, I wasn't able to find all the books suggested. 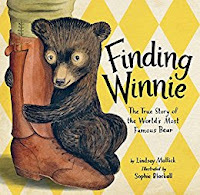 Finding Winnie: The True Story of the World's Most Amazing Bear by Lindsay Mattick with illustrations by Sophie Blackall No poetry here. The dramatic tension here is caused by the war setting, I think. I'm kind of lost with the visual metaphor part. I am a word person. Blockhead: The Life of Fibonacci by Joseph D'Agnese with illustrations by John O'Brien. Once again, no poetry. The dramatic tension is created because of the newness of what Fibonnaci is doing. The visual metaphor...there are spirals hidden in many of the pictures here. Fibonacci numbers have some scientific (or perhaps mystical) connection to nature and appear in spirals. I've read this before. I still don't get it. Evidently, you have to make a grid of squares and plot these numbers on it and Eureka! you have a spiral. But who came up with the grid idea? Oh, yeah. Fibonacci. I'm bad with numbers. Bad with visuals. This is not a good ReFoReMo day for me. 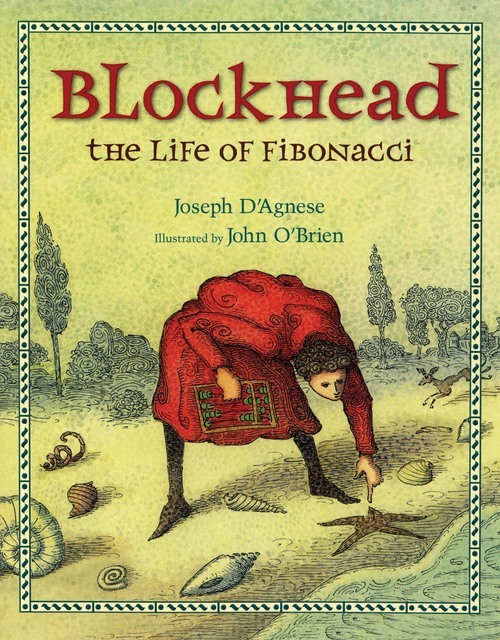 Can I use any of the picture book bio suggestions in my picture book manuscript? Well, it's not a bio, but dramatic tension is always good.